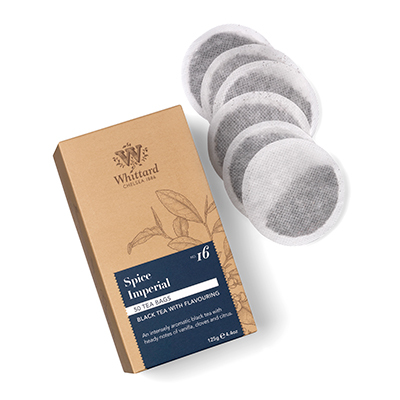 Looking for Spice Imperial Teabags? Gather around the fire for strange tales from the spice markets of ancient trade routes – this classic Whittard blend balances a smooth, full-flavoured black tea with aromatic cloves, zesty orange peel, sweet Madagascan vanilla and a scattering of yellow safflower petals. We love this spiced tea on dark winter evenings, and it's also rather good served iced with plenty of fruit on hot summer days. Loose Leaf Tea- Black Tea, 4% Orange Peel, 2% Cloves, Flavouring, Safflower Petals, Vanilla Pieces. This is a gorgeous, warm spicy tea- chai was my favourite but this beats it hands down. Its aroma is warm, subtle and enticing and the taste doesn’t disappoint - as so many can. Perfect for anytime and is great with milk. I am from America. I visited for the first time in 2012 and fell in love with this tea! I loved it so much I brought it home with me then and ever since I have been importing it. I love the spice, the orange, everything about it. I will continue to order this! Such an unique and delicious flavour! Definitely my favourite tea from Whittard. Founded by a royal decree from Queen Elizabeth I in 1600, the East India Company was the largest importer of tea and spice during the British Imperial period. We’ve numbered this tea 16 to mark over four centuries of British tea drinking.